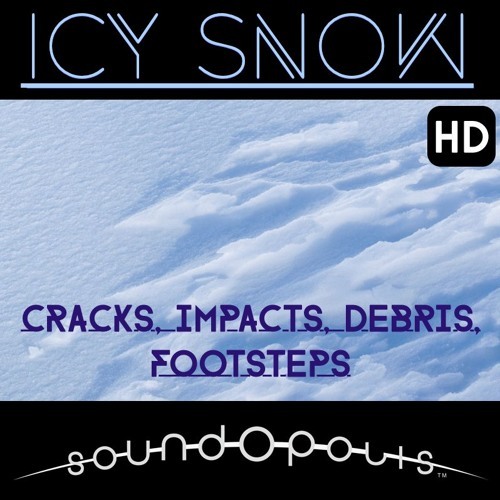 This is a demo for Soundopolis' sound effects library, Icy Snow HD. The sound effects library is available for purchase at www.soundopolis.net . Quick Look: Files: 147 Size: 266 MB unzipped Format: WAV Fidelity: 96k/24bit Channels: stereo Sounds: -	Footsteps on ice-covered snow o	Note that each footstep file contains a series of footsteps. -	Ice Impacts -	Ice Debris -	Ice scrapping & crushing -	Snow Impacts w/debris Icy Snow HD came about in March 2015. Here in Michigan, we already had around a foot of snow on the ground, when we also got freezing rain and sleet. This created ~ 1/8” layer of fairly smooth ice on top of the snow. So I ran out there with my Sound Devices 702T, and a RØDE NT-4, and started recording. The first thing I noticed was that ice debris would glide noisily across the ice sheet producing a unique sound – at least much different than debris sliding across a frozen pond. With the ice being rather thin, and therefore more prone to vibration, but with the snow underneath adding a bit of a baffle, the sound was just “different” from anything I had heard before. So, I broke off pieces of ice and smashed them on the ice sheet, sending debris flitting and skidding across the yard, over little mounds and imperfections in the ice. Then I slid some ice down a 6’ mound that the snow plow had created, which was also covered in 1/8” of ice. I also recorded some great footsteps, with a nice ice crack, and the subsequent “plouff” as my foot went through the snow. Next, I pressed my boot, and then my hand slowly on the ice, and captured some great ice stressing and cracking sounds (“Ice_Stress_Crack_...”). Once much of the ice had been pulverized by these various tasks I performed some “snow stomps”, which would work well as either huge snowball hits, or body-fall sounds (labeled “Snow_Impact_...”) Check out the track list for more details. This collection provides some new and interesting sounds, as well as a ton of variations so your soundtrack never gets old! All Soundopolis tracks include metadata tags so they are easy to find using any search engine. All tracks are delivered as 96k/24bit .wav files. Collections come in easily downloadable zip files. All sound effect and music copyrights belong to Soundopolis, LLC and David Fienup.